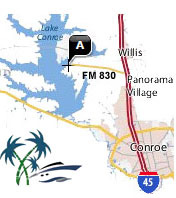 The Palms Marina on Lake Conroe, located at the end of FM 830, is the finest and most complete of Lake Conroe’s Marinas. Owned and operated by the owners of E-Z Boat Storage and Valet Launch the marina has been transformed into a gated Super Marina for boaters and fishermen everywhere. Over 150 State of the Art, “full service” covered boat slips float in a breakwater protected deep water harbor. Dry boat storage units with concrete drives supplement the marina’s floating docks. 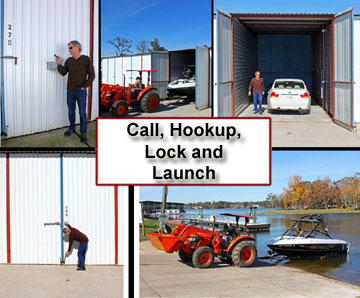 Readily available Valets and tractors insure immediate placement of boats in the water for our 580+ dry storage tenants. Our Ship’s Store and fuel dock, featuring 3 grades of Valvtect Marine gasoline and diesel, now services boaters on Lake Conroe with low prices. Security gated executive restrooms, laundry & showers were built adjacent to the floating marina with a covered breezeway and deck. Besides having the quickest and easiest access from the Houston Metropolitan area, the marina’s basin is 15-20 feet deep and surrounded by an earthen breakwater. High winds and waves or low lake levels won’t keep The Palm’s boaters off the Lake. Neither will spiders or insects since an advanced repellant system has been installed throughout all floating docks. Big Boats will love this location with slips as large as 18′ x 60′ complete with up to dual 50 amp electrical service and “from your slip” sewer pump-out stations. High Speed Internet Access connects tenants to the real world and an on-site patrol maintains safety and security throughout complex. 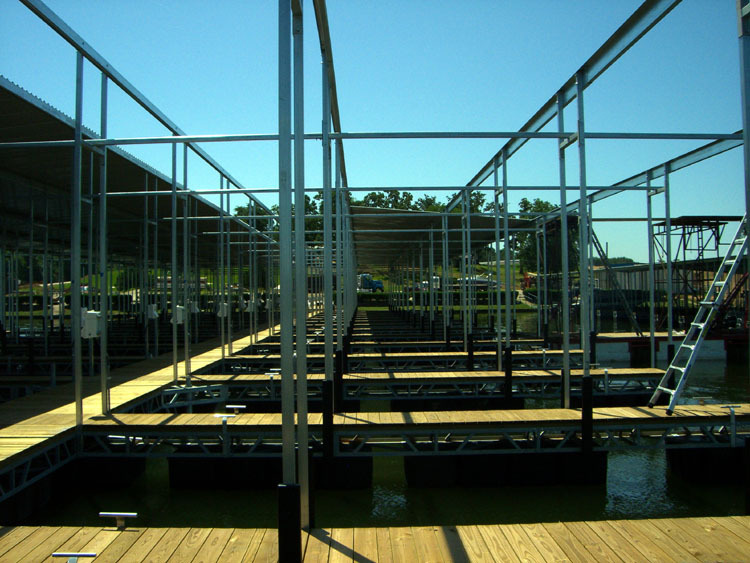 Our Dry storage buildings will accommodate boats over 40′ without lowering canopies or sport racks. Trained tractor drivers pull your boat in and out of the water. Park your car or truck inside your unit, keeping it cool and secure. You have 24/7 access to our private boat ramps for boating before or after “valet” hours. The Best Deal on Gasoline! All dry and wet storage tenants get to pump fuel into their Lake Conroe boats at substantial discounts from retail prices on the lake. Simply present your discount card when filing up with Valvtect Marine gasoline and diesel. Cheaper gas pricing is just another benefit we provide our tenants to make your Lake Conroe Boating Experience better than “the guys across the lake”. The entrance to The Palms requires a gate code for access to the complex during non-operational hours. 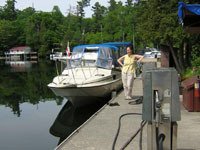 Entry to the floating docks and boat slips are securely gated with boat owners gaining access by inserting “key numbers” to open walkway gates. At night, a watchman will be on-site, helping to protect your investment and safety. 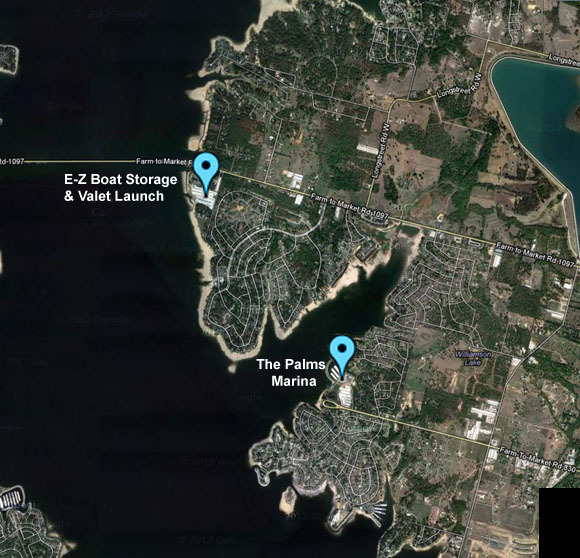 Located on Lake Conroe, a few miles west of I-45, The Palms Marina is just minutes from Conroe, Texas. Among The Most photographed sites on the lake, easy access to the marina, and easy access to the lake means more time boating and less time commuting. 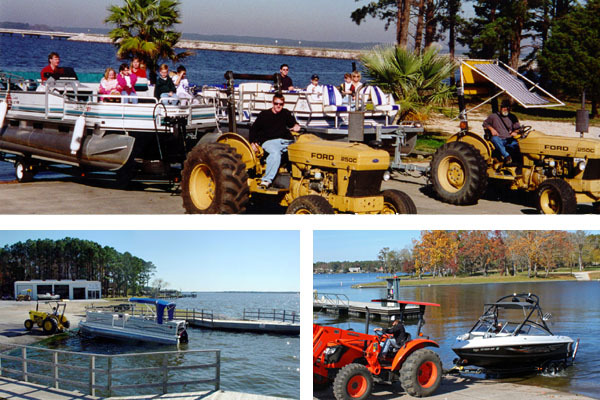 Our Lake Conroe Marina has Lake Conroe boat storage serving both small and large powerboats. The marina is large enough to meet all of your boating needs, but small enough to know your neighbors. Although The Palms Marina is one of the most well kept marinas on the lake, we are constantly renovating to maintain it as one of the most modern. If you haven’t visited Lake Conroe recently you haven’t seen this marina. Although a convenient location and picturesque setting may draw boaters to The Palms, it is our staff that wins and keeps their business. From the dockhands to the general manager, our customers come first. We pride ourselves on providing excellent service. You won’t find overpriced restaurants, loud bars, or crowded convenience stores at The Palms Marina. You will find a quiet, relaxing, and photogenic setting staffed with people who want to help make your boating experience enjoyable. You will also find clean restrooms, convenient covered work areas, ample paved parking, fuel, ice, and other amenities. The Palms Marina is always expanding its storage capabilities. Visit our photo gallery for up-to-date aerial photos of our facility and web cam photos of sunsets from the Palms Marina. Having a variety of new and used(pre-owned) boats of many types and models, these guys can get you on the lake. Should you have a boat already, the service department can get you back there too. Should you need to sell your ship or detail it, they offer all the answers you need. Visit their website at www.texasboatsales.com. I've dry docked my boat at Palms for the past three years and can say with confidence that the experience has been 100% positive across the board. The staff is amazing, quick to respond to any and every request, very accommodating and generous. The "Ship Store" is well stocked with the basics, the dock service (fuel) process is very easy and efficient, the dock service (boat pick up at the ramp) is excellent. The drivers are incredibly accurate. If considering a place to dock your boat, I recommend The Palms... You'll be well taken care of here. at Palms marina was excellent. I have to say that after 26+ years in Hospitality/Customer Service we have never had the Service Level we experienced at the Palms Marina and it was all because of this young lady Lindsay. She is what we would call a Top Notch Exceptional Employee that truly takes pride in what she does. With a Fantastic attitude she made a couple of new boaters feel at ease with our 24’ cabin cruiser (Magic Lady). Although it was reaching 90 and no clouds, this young lady kept a smile on her face and a spring in her step, never heard a single complaint from her about anything. She walked this big boat up and down the dock and handled the waste water cleanout like a pro. We Recommend Palms to anyone who wants a Clean, Easy Access and Fantastic Fuel Service Facility – Go on weekends and see Lindsay. 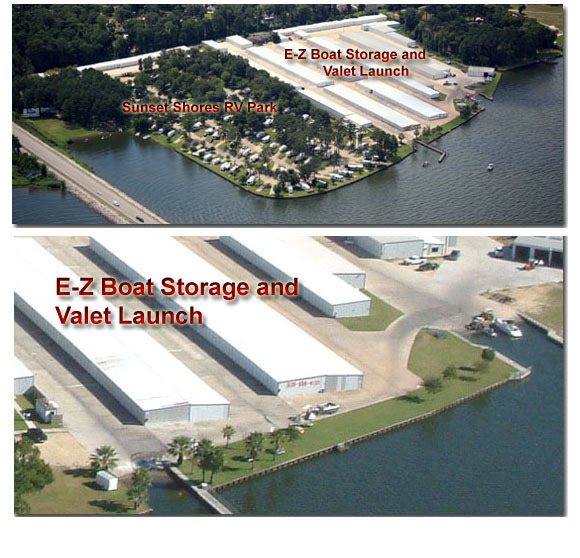 The Palms Marina and our sister location, E-Z Boat Storage & Valet Launch, combine to offer Lake Conroe’s Largest, Cleanest, and Easiest Dry Storage Launching Facility. Pioneering the use of tractors and trained operators to launch each boat, getting in and out of the water is both fast and painless. See why thousands of boaters have made The Palms and EZ Boat the places where summer fun begins. 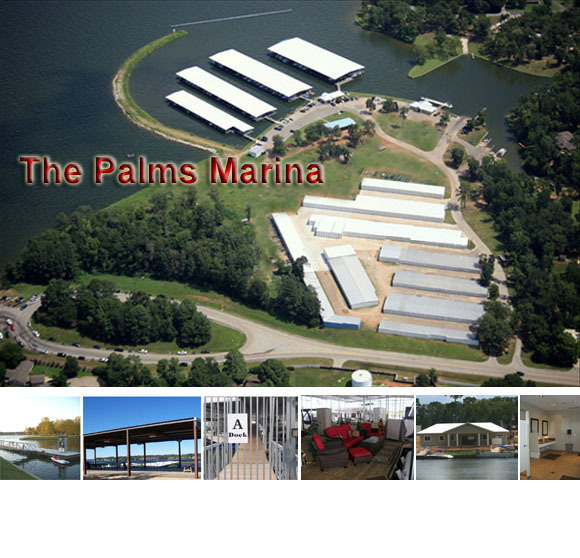 The Palms Marina and E-Z Boat Storage are state-of-the art boating complexes with dry and wet storage for amost any size boat. These are both ‘park and launch’ valet style operations. The Palms Marina also provides more than 150 recently built wet slips in their deep water basin. Lake Conroe keeps growing and growing and so does demand for boat slips and stalls. With few public launching facilities, your practical solution for summertime fun can be found at these 2 storage facilities, both being close to I-45. Servicing over a Twelve Hundred and Fifty (1250+) Boat Owners, The Palms and E-Z provide boaters a first-class experience and secure environment for their boat. And when you are out on the lake, your car or truck are equally secure, not to mention ‘out of the sun’. 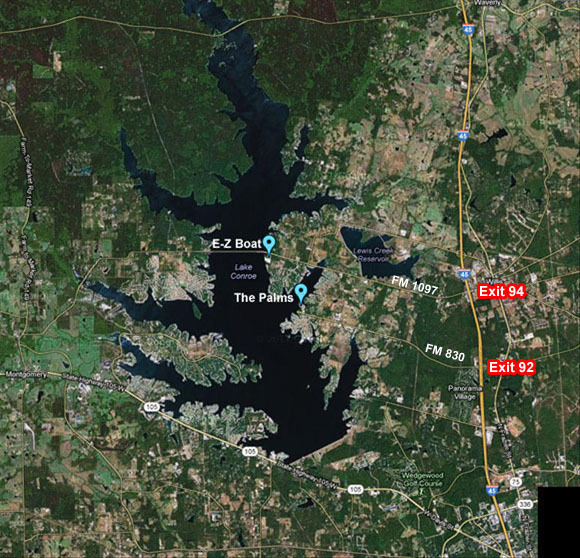 These premiere locations are locally owned and operated by the Richardson Family with over 40 years of businesss history on Lake Conroe. The last 20 of those years have been in the boat storage industry.